"The $300 Epiphone that I have, it's one of my most faithful and greatest soldiers. It's the best hammer I have in my tool bag, because that's what I do: I hammer. I'm self-trained and I play because that's my religion: music." Josh Homme's unique philosophy on gear and hammering it has led him to become one of this generation's most respected and influential guitarists. And he's putting that philosophy to stunning use in Them Crooked Vultures - you can read all about it in the March issue of Guitarist magazine, on sale in the UK today (16 February). "I consider myself Malcolm Young, that's how I like to play guitar," says Dave Grohl. "I like to play guitar like a drummer. When I look at a guitar I almost look at it like a drum set where your low E string is the kick drum, your A and D are the snare and so when you're writing riffs I use the lower notes as kick and snare and the higher notes as cymbals." Like we said - a unique philosophy. 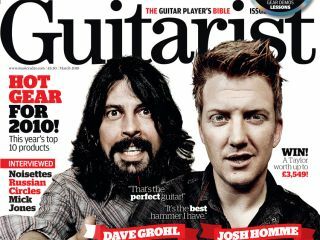 So learn from the masters in issue 326 of Guitarist magazine with the definitive Them Crooked Vultures guitar interview which goes in-depth on the guitars, amps and pedals in their arsenal. Grohl also compares the Vultures' dynamic to that other rather famous power trio in which he occupied the drum stool: Nirvana. Also interviewed in Guitarist issue 326: Foreigner's Mick Jones, Russian Circles' Mike Sullivan, The Noisettes' Dan Smith. There's also your chance to win one of two Taylor Build To Order guitars worth up to £3549, Guitarist's pick of the finest products from NAMM 2010, and definitive reviews of the hottest new gear including Fender's new American Specials, the Fuchs Overdrive Supreme Combo, crazy Moog and EHX pedals and much, much more. Subscribe to Guitarist online here.